Distributor: Currently licensed by Section 23 Films. Notes: Continuation of the Mobile Police Patlabor series. A mysterious, crackpot scientist heavily associated with a program known as the Babylon Project commits suicide. Soon after, a military labor goes berserk in the jungles. It takes almost an entire army to subdue it, and when the labor is quelled, no sign as to the cause of malfunction can be found anywhere. The fate of Tokyo, and all of Japan for that matter, is held in the balance as the Mobile Police slowly start to put seemingly unrelated incidents and clues together to find out the sinister truth about the Babylon Project. Okay, okay, so the synopsis is really short. I'll explain why later. First things first: Patlabor is a movie with mechas in it. Patlabor is a movie about mechas going berserk. 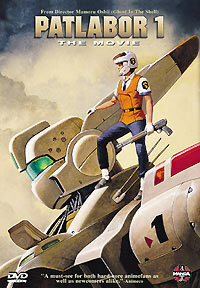 Therefore, Patlabor is a swashbuckling, pedal-to-the-metal action flick with explosions and such galore. WRONG!! If you watch Patlabor 1 with this kind of mentality in mind, you're bound to be deeply disappointed. While Patlabor has all the trappings to become a potential wicked-fast action anime, it does just the opposite of what you would expect. The pace of Patlabor is deliberately slow and moody, choosing to move on only when it's absolutely sure that there's nothing else to be found in the current scene. While there is some really smart action near the very end (I notice that it's the only thing Manga puts in their trailers regarding Patlabor), on the whole, Patlabor does not try to be an action flick. So what you get instead is a brooding, thinking mystery flick that happens to have mecha in it. If you like that sort of thing, you'll be in hog heaven with this one. The art is nicely drawn, and sometimes vacillates between really cool realistic scenes to warped, out-of-perspective viewpoints (usually when the police argue with each other). Great scenery and atmosphere are the norm here. The soundtrack is abstract and moody (have I used that word too much yet? Naaah), which fits the tone of the flick nicely. To say anything about the plot would spoil the surprises and revelations Patlabor has in store for you (hence the really short synopsis). The puzzle is revealed to you piece by piece, allowing you to absorb the sinister enormity of what's in store if the Mobile Police don't act in time. Overall, if you've got a store of patience and don't mind having to think during your anime, you'll love this intelligent, pondering anime. If you want action, though, you had best make your way elsewhere. Recommended Audience: Lots of profanity thrown about by the boys in blue. Not a lot of violence (most of it is at the end to smash all the berserk mecha and such), but younger audiences will be bored stiff by this one. A few adults will be, too.